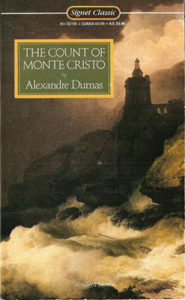 When a friend of mine recently said, “Hey, I think I’m going to read the Count of Monte Cristo.” my initial response was, “Oh, I have a copy of that” …and then I scoffed. But after some consideration, I realized that I had never actually picked it up and read it. The tales woven by Alexandre Dumas have become part of our culture in a way – we all know of The Three Musketeers, The Man in the Iron Mask…that elusive count. But do you really know the stories? Other than a brief run in with Leonardo DiCaprio back in the day (when I was paying less attention to plot and more attention to other things), I got honest with myself and realized that I had no idea what these stories were really made of. So, I decided to try to tackle the Count head on. And what a book it was. The first thing that struck me was the writing style – flamboyant and (seemingly, at first) overly descriptive. Do we really need this much detail or that much dialogue? But what Dumas was cleverly doing was setting the stage for the grand reveal(s) at the end – and by that point I was emotionally invested in the characters – thanks to all of the upfront groundwork. It read, in a way, like a soap opera, without all of the overt sexuality that usually comes with that territory. There are mysterious deaths, satire, romances, (almost) duels…and at 500+ pages in my edition, it surprisingly didn’t drag along. And without doing any research about the history of the novel (that’s coming shortly…), it feels as if the book were suited for serialization…each chapter leading into the next with finesse or cliffhangers that keep the pace moving or the reader wanting more. The plot in in itself is a bit formulaic. You have your hero, who starts out innocent, in love, fairly happy. But alas, people jealous of his good fortune conspire against him, not just foiling his plans but essentially ruining his life. After 14 (yes, 14) years in a prison where some somewhat unbelievable things take place (who really tunnels under the floor of a jail? ), he achieves his freedom and happens upon fortune. And the rest of the story follows his attempt to attain revenge against the families that destroyed his happiness. It’s actually quite intricate plot development, with the building of characters and causing them to overlap and run into one another. In some ways, it seems, that they further the plot along and assist the Count in exacting his revenge just by being themselves. Or perhaps he can anticipate their actions. There was a brief pause, during which Louis XVIII. wrote, in a hand as small as possible, another note on the margin of his Horace, and then looking at the duke with the air of a man who thinks he has an idea of his own, while he is only commenting upon the idea of another. While placed historically to give the novel a familiar backdrop for readers at the time, the monarchy and the usurper (Napoleon) play interestingly limited roles in the novel. Once Edmond Dantes is convicted for plotting against the crown, the government fades in the novel and the different prominent families in the novel take over. What struck me was how clearly Dumas painted the characters. They all come off the page in their own unique way. You can envision M Nortier blinking and motioning at his granddaughter Valentine, desperate to communicate. You can sense Mme Morcerf’s curiosity at the strange and new Count and the recognition in her eyes as she sees him for the first time. You can even tell that Mme Villefort is up to no good before everyone else does – and her kind of evil is of the most pure kind. I also happened to like the ending of the novel. I don’t think the book is about whether or not you are on The Count’s side or whether you think he’s right or wrong in all of the chaos that he orchestrates. Four hundred pages in, it’s easy to forget that he was the original victim in the novel. Dumas finds a way to give him a level of happiness and redemption in spite of it all, though I’m not sure that the way he wrote it was 100% believable or natural. If you are considering reading this book, I HIGHLY recommend that you make sure your edition of the novel is unabridged. I assumed that my Signet Classic copy was, but I was fooled and only realized halfway through my reading. I didn’t double back or try to reread it, figuring I had already made a considerable commitment to the book. But it does make me wonder what I really missed out on. And why is The Count of Monte Cristo still relatable today? The themes of politics and wealth manipulating people to commonly devious ends. The themes of forbidden love, difficult parents, desire for adventure, and – but of course – the need for revenge when we are wronged so unjustly.